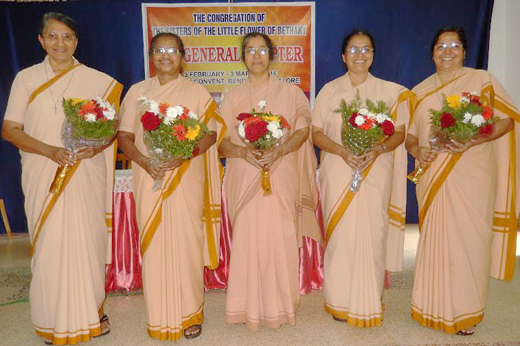 Mangaluru, Feb 13, 2016: The Sisters of the Little Flower of Bethany, better known as Bethany Sisters, indigenous to Mangalore, elected a new Superior General in the person of Rev. Sr Rose Celine, BS February 11, 2016 during the ongoing XVI General Chapter of the Congregation, held at the Motherhouse, Bendur. She is the 10th Superior General of Bethany Congregation which was founded in 1921 by Servant of God RFC Mascarenhas,(1875-1960), a priest of Mangalore diocese. He is the first Mangalorean to gain the privilege on being put on the path to sainthood in the church. in education, social action, medical aid, care of elders and so on will get a modern direction with this step it is expected. The Congregation also elected a team of four Councilors to the Superior General - Sr Lillis BS, Sr Shanti Priya BS, Sr Mariette BS and Sr Lilitta BS.